The client application receives an HTTP 400 - Bad request response with the message "The SSL certificate error". This error is typically sent by the Edge Router in a two way TLS setup enabled for the incoming connection to Apigee Edge. This issue typically happens for a 2-Way TLS, when the certificate sent by the client is expired. In a 2-way TLS, both client and server exchange their public certificates to accomplish the handshake. The client validates the server certificate and the server validates the client certificate. In Edge, 2-way TLS is implemented at virtual host, where the server certificate is added to the Keystore and the client certificate is added to truststores. During the TLS handshake if it is found that the client certificate is expired, then the server will send 400 - Bad request with the message "The SSL certificate error". Log in to the Edge UI and view the specific Virtual Host configuration (Environment Configuration -> Virtual Hosts) for which the API request is being made, or use Get Virtual Host management API to get the definition of the specific Virtual Host. Determine the Truststore reference used in the Virtual Host. In the above example, the Truststore reference name is myTruststoreRef. Determine the Truststore pointed to by the Truststore reference. In the Edge UI navigate to APIs -> Environment Configurations. Select the References tab and search for the Truststore reference name. Note down the name in the Reference column for the specific Truststore reference. This will be your Truststore name. In the above example, notice that myTruststoreRef has the reference to myTruststore. Therefore, the Truststore name is myTruststore. The certificate with alias client-cert-markw in the above example, shows that it's expired. Check if the certificate is expired for the certificate alias for your truststore. If the certificate is not expired then move to Common Diagnosis Steps for the other Causes. Create a new truststore, for example myNewTruststore. Upload the new certificate to the newly created truststore. Modify the trustore reference used in the specific Virtual Host to point to the new truststore using the steps given in Modifying a reference. In the example described above, point the reference myTruststoreRef to myNewTruststore. To investigate this issue, you will need to capture TCP/IP packets using the tcpdump tool. If you are a Private Cloud user, then you can capture the TCP/IP packets on the client application or Router. If you are a Public Cloud user, then capture the TCP/IP packets on the client application. Note: If you are taking the TCP/IP packets on the Router, then use the public IP address of the client application in the tcpdump command. If you are taking the TCP/IP packets on the client application, then use the public IP address of the host name used in the Virtual Host in the tcpdump command. Refer to tcpdump for more information about this tool and for other variants of this command. Analyze the TCP/IP packets collected using the Wireshark tool or similar tool with which you are familiar. 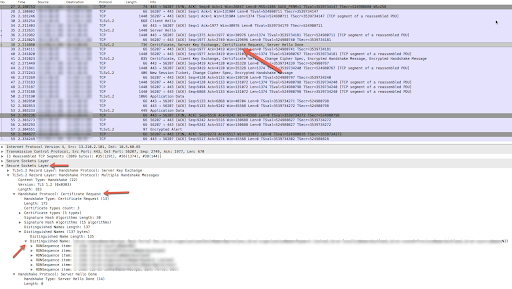 The Packet #30 in the tcpdump (image below) shows that the Client Application (source) sent a "Client Hello" message to the Router (destination). 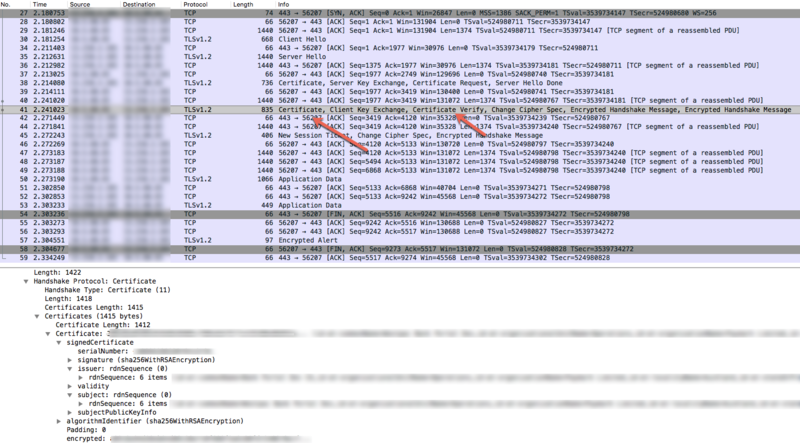 Packet #34 shows that the Router acknowledges the Client Hello message from the client application. The Router sends the "Server Hello" in packet #35 and then sends its certificate and also requests the client application to send its certificate in packet #38. In the packet #38, where Router sends "Certificate Request" packet, check the "Distinguished Names" section which provides details about the client certificate, its chain and certificate authorities that are accepted by the Router (server). The client application sends its certificate in Packet # 41. Check the Certificate Verify section in packet # 41 and determine the certificate that is sent by the client application. Verify if the subject and the issuer of the certificate and its chain sent by the client application (packet #41) matches with the accepted certificate and its chain from the Router (packet #38). If there's a mismatch then that's the cause for this error. Hence the Router (Server) sends the Encrypted Alert (packet #57) followed by FIN, ACK (packet 58) to the Client Application and eventually the connection is terminated. The mismatch of the certificate and its chain can be caused by the scenarios described in the following sections. This typically happens if the subject/issuer of either the certificate and/or its chain sent by the client application does not match the certificate and/or its chain stored in the truststore of the Router (Server). Login to Edge UI and view the specific Virtual Host configuration (Environment Configuration -> Virtual Hosts) for which the API request is being made, or use the Get Virtual Host management API to get the definition of the specific Virtual Host. Determine the Truststore reference used in the Virtual Host. In the above example, the Truststore reference name is myCompanyTruststoreRef. Determine the Truststore pointed by the Truststore reference. Note the name in the Reference column for the specific Truststore reference. This will be your Truststore name. In the above example, notice that myCompanyTruststoreRef has the reference to myCompanyTruststore. Therefore, the Truststore name is myCompanyTruststore. Get all certificates for a keystore or truststore. This API lists all the certificates in the specific Truststore. Get Cert Details from a Keystore or Truststore. This API returns information about a specific certificate in the specific Truststore. Check if the issuer and subject of each of certificate and its chain stored in myCompanyTruststore matches with that of the certificate and its chain as seen in the TCP/IP Packets (refer packet #38) above. If there's a mismatch then it indicates that the certificates uploaded to the truststore are not being loaded in the Edge Router. Move to Cause: Client Certificates not loaded in the Edge Router. If there was no mismatch found in Step #5, then that indicates that the client application did not send the right Certificate and its chain. Ensure that the correct certificate and its chain are sent by the client application to Edge. If you are a Public Cloud user, contact Apigee Support. Check if the file /opt/nginx/conf.d/OrgName_envName_vhostName-client.pem exists for the specific virtual host. If the file does not exist, move to the Resolution section below. Check the issuer, subject and expiry date of the certificate. If any of these do not match with what was observed in the Truststore in Edge UI or using the management APIs, then that's the cause of the error. It's possible that the Router did not reload the uploaded certificates. Re-run the APIs and check the results. If the problem persists, go to Gather Diagnostic Information. TCP/IP packets captured on the Client Application or Router.